The East Focus Retreat for Grace Brethren pastors and ministry leaders concluded Wednesday at Ocean City, Md. Led by Clancy Cruise, pastor of Marysville Grace Church in Marysville, Ohio, who also serves as the executive director of the Fellowship of Grace Brethren Churches, the two days focused on the pastor and his family. On Monday and Tuesday, participants divided into small groups to discuss issues relevant to their situations. Tuesday afternoon allowed free time for resting, walking the beach, playing golf, and enjoying the company of other pastors and ministry leaders. Wednesday morning, Cruise closed with a brief devotional from Ephesians 5. 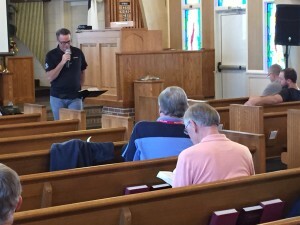 Sessions were held in a local church while retreat participants stayed and enjoyed meals at the Holiday Inn and Suites along the Boardwalk in Ocean City. The next Focus Retreat, for pastors and ministry leaders in the East region, will be held January 30 – February 01, 2017 in Southern California.